For homeschooling math you need a good curriculum. Textbooks help my children learn in a systematic way. I have used several programs teaching my children. Some of my children struggled with math. I had to find materials that would work for each child. Read below what programs that I used with my children. I also like to find practical hands-on ways to teach math concepts. This helps make learning fun. Children need to know that we use addition, subtraction, fractions, and measuring every day. I will share with you my ideas for hands-on activities. It is possible to teach math especially during the elementary school years without a curriculum. Look on the internet for free math worksheets. One reason that I used a curriculum was to keep me on track. When considering which curriculum to buy for homeschooling math consider the teaching approach used. Some companies use a spiral approach while others mastery. In the spiral approach your child learns several math skills at the same time. In the mastery approach your child will study a topic for several days or weeks. Hopefully he will master the concept before moving on to something new. I wished that I had used a mastery program with my children in the beginning. I think not spending time on one concept confused them. The never really learned about addition before they learned subtraction. My children and I like to use curriculum that gives step-by-step explanations. My children also like materials that they can use independently. Saxon Math - When my children were young we used this program. It used a spiral approach. The kindergarten through third grade uses a manipulative to help children understand math concepts. There are also Saxon programs for fourth through high school. Saxon uses the spiral approach. Other homeschooling math programs teach mastery of addition and subtraction before introducing multiplication and division. Math U See uses a mastery approach. The first books teach about counting and addition. When your child has mastered addition he will learn about subtraction. Touch math is a mastery program for children learning basic math skills. It is a multisensory math program. Each number has touch dots that the child learns to count. I used the program with autistic children in a public school. Bridgeway Math I bought the second semester of pre-algebra for my daughter. Each section was on a different topic. Each lesson in the section builds on the last lesson. If she missed a question she was to rework the problem to get the correct answer. At the end of the section each section is a review. If she receives eighty percent on the review then she can take the test. The curriculum uses a mastery approach. IXL Learning My son used IXL one year. It is an online program. You can find problems for preschool through algebra. Several review questions from previous lessons,a new concept that is by the teacher, problems about the new concept, and a story problem. The algebra book is a little different in that it does not have story problems in every lesson. My son likes the short lessons. You can also watch free videos of the lessons online. Math Essentials combines the mastery and spiral approach. I like to make homeschooling math practical. When my children were young we used food to understand math concepts. We used raisins, small candies, and other small pieced of food to count, subtract, and divide. Crackers are good for teaching geometry. You can find squares, rectangles, circles, and triangles. Learn about cubes by looking at sugar cubes. Use oranges to teach about spheres. Canned goods can represent cylinders. Food can also be used to teach about fractions. Cut sandwiches into half, thirds, or fourths. Recipes can teach your child to read numbers and fractions. My children also learned how to measure dry and liquid items. When my children were older we would double recipes so they could practice adding fractions. Cooking can also teach about time. While you are waiting for the food to get done you can talk about how many minutes are in an hour. Money - When my children were young I liked to use real coins to teach about money. Each day I would give my child a cup of coins that they were to count. Time - Here are some ways to make homeschooling time easy and practical. Geometry - Here is some ideas for teaching about shapes to elementary aged children. Fractions - I like to use a manipulative to teach about fractions. 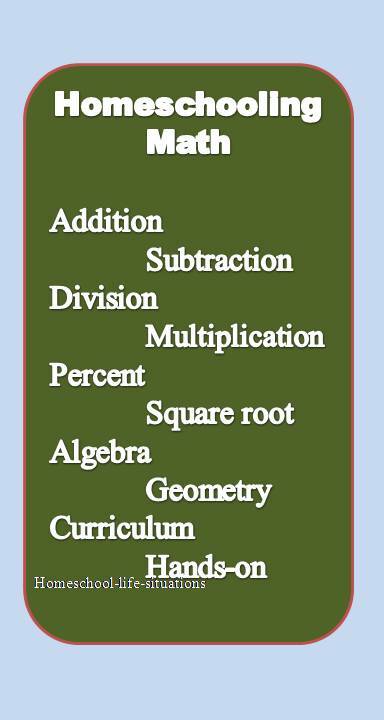 There are also many practical ways to each about fractions. Manipulative - A list of items your child can use to help him solve math problems. When you are homeschooling math go beyond the worksheets so that your child can develop number sense.